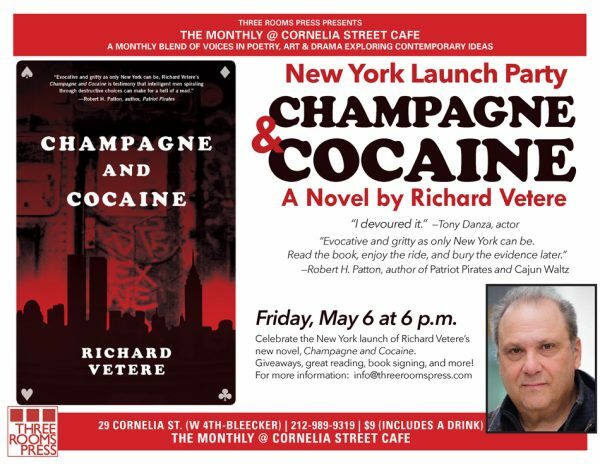 Award-winning New York author RICHARD VETERE celebrates the release of his thrilling new novel CHAMPAGNE AND COCAINE with a reading at Cornelia Street Cafe on Friday, May 6 at 6 pm. “An Evening with Richard Vetere” will feature the author—whose previous books include The Writers Afterlife and The Third Miracle-—reading from his new book and sharing stories about what inspired it. A book signing follows the reading. Cornelia Street Cafe, 29 Cornelia Street (btwn W. 4th & Bleecker), 212-989-9319. Admission $9 (includes a free drink).